The mission of the The EDGE is to provide opportunities for entrepreneurs to help startups and to drive growth of their businesses. The EDGE supports both new and established firms by providing space and learning opportunities, all designed to help build and grow businesses, innovation, and jobs. Started in 2012 and located in a new 26,000 square-foot facility, The EDGE is an incubator and accelerator that focuses on growing and supporting entrepreneurs. It is located at 2627 10th Avenue, Tuscaloosa, about 1.5 miles from The University of Alabama campus. The EDGE features 20 offices, 100 workstations and several conference rooms, all offered to established entrepreneurs, people seeking to build their businesses, and individuals who need working and networking space. Memberships are offered on an annual or monthly basis; a daily drop-in program will also be made available for those with short-term or intermittent needs. Regular workshops, seminars, and clinics are held at The EDGE to connect entrepreneurs with fellow innovators and assistance. The EDGE also hosts special events such as pitch competitions that bring together the West Alabama entrepreneurial community. 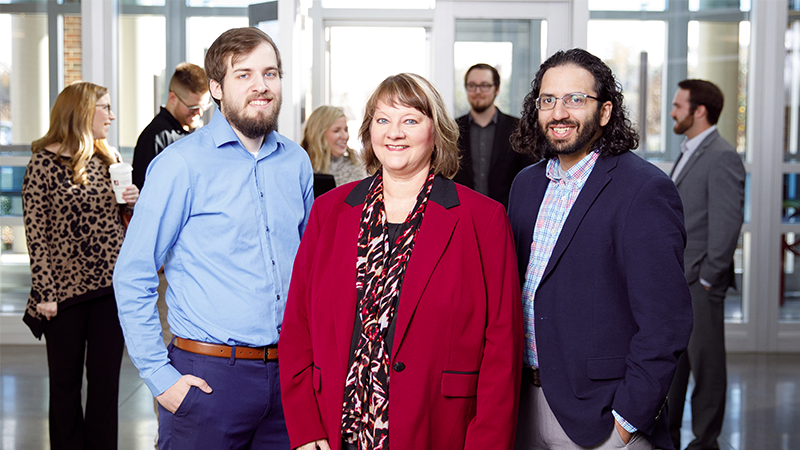 The EDGE team, from left to right, Michael Larsen, Dr. Theresa Welbourne, and Joshua Sahib.